New Zealand is a relatively small part of a large continent, mostly submerged, known as Zealandia. The land above sea level is either being uplifted or built up by aggradation. This map shows the estimated or measured uplift rates in different parts of the country. The mountain ranges are rising the fastest, in excess of 5 millimetres per year. The greatest rate of uplift is on the western side of the Southern Alps. A few areas are slowly subsiding, but most of these are being filled in by sediment carried seaward by the rivers. 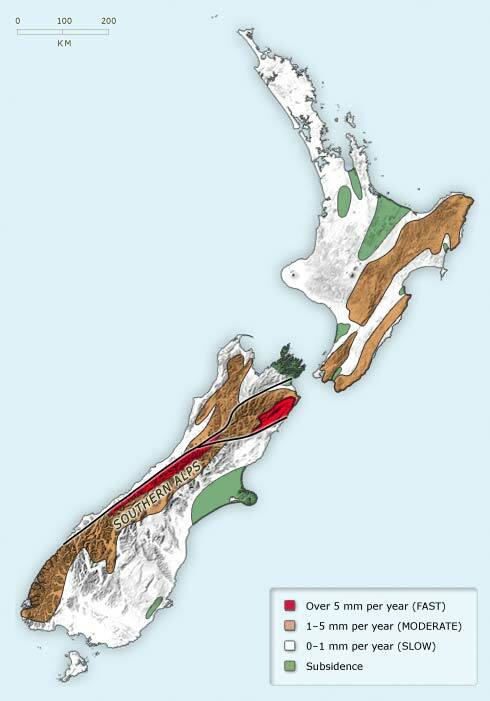 Source: Cartography by Carolyn Hume, GNS Science, based on maps by Harold Wellman (South Island) and Brad Pillans (North Island), with some generalisation.